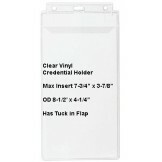 Vinyl 3"x 4" Conference Badge Holder-100 pack Holder has slot hole, 2 lanyard & 2 neck cord hol..
Badge Holder Conference CUSTOM 3" X 4" 100 pack Price is for 100 Badge Holders .. 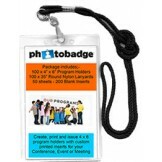 CUSTOM 3" X 4" Conference Badge Holder 100 pack Price is for 100 Badge Holders Top Color Insert ..
Color Frame Imprinted Badge Holders Horizontal 1,000 Pack 2 Colors Included 1 Frame Color + 1 Print..
Vinyl 3" x 4" Conference Badge Holder + 38" Round Nylon Lanyard - 100 pack Lanyard has steel swivel..
Vinyl Top Load 3" X 4" PVC Conference Badge Holder w/pin-500 pack Maximum Card size 3" x 4" Price ..
100 per pack Vinyl badge holder w/bulldog clip Maximum Card size 3" x 4" Price per holder & l..
Vinyl Top Load 4" x 6" Conference Badge & Program Holder Price as low as $0.65 each Ideal For ..
Vinyl Top Load 4" x 6" Program Holder + Lanyard -100 Pack Inlcudes 100 holders & 100 Round Nylo..
Vinyl Top Load 4" x 6" Program Holder As low as 68c each Ideal For Special Events Maximum Insert ..
Vinyl Top Load 4" x 6" Program Holder + Lanyard + Inserts - 100 Pack Inlcudes 100 holders, 100 Roun..
Clear Vinyl single pocket Program Holder Maximum Insert Size 4.6" x 5.75" Priced as low as $1.15 P..
Clear Vinyl single pocket Program Holder Maximum Insert Size 5.7" x 8" Price Per Holder $1.40 ..
Vinyl Top Load 8.5" x 4.25" Credential Holder-100 pack Has Closing Flap Maximum Insert Size 7.75" .. 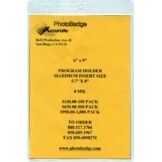 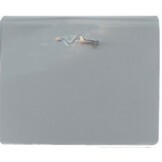 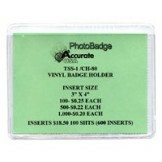 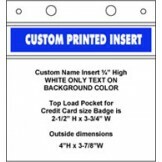 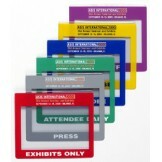 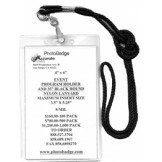 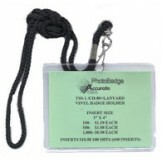 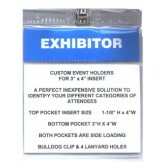 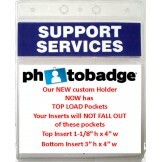 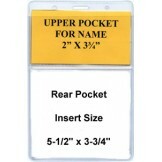 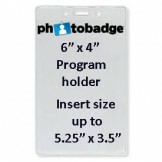 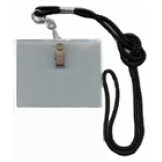 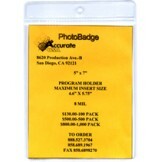 CUSTOM NAME & CREDIT CARD Conference Badge Holder 100 pack Price is for 100 Badge Holders To..